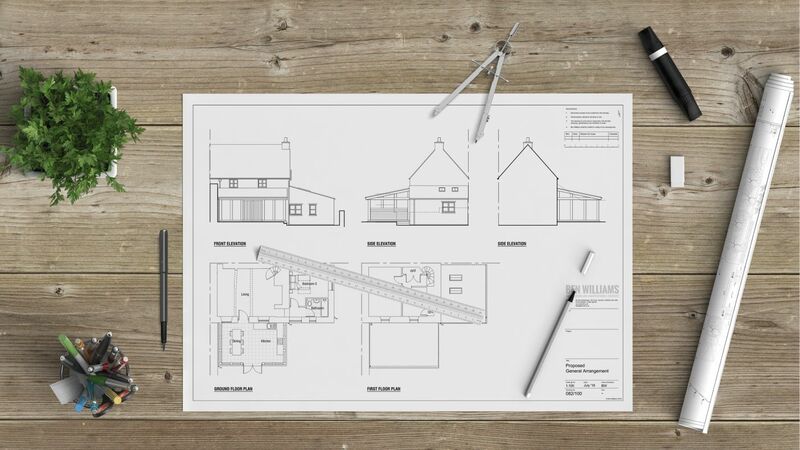 What drawings are required for a planning application? Every planning application requires two sets of drawings that show the existing and proposed design schemes. The existing drawings are compiled from a measured building survey illustrating floor plans, elevations, sections and the relationship to adjacent neighbouring properties. The proposed drawings must show the proposal, for example a kitchen extension, garage conversion or a new home. 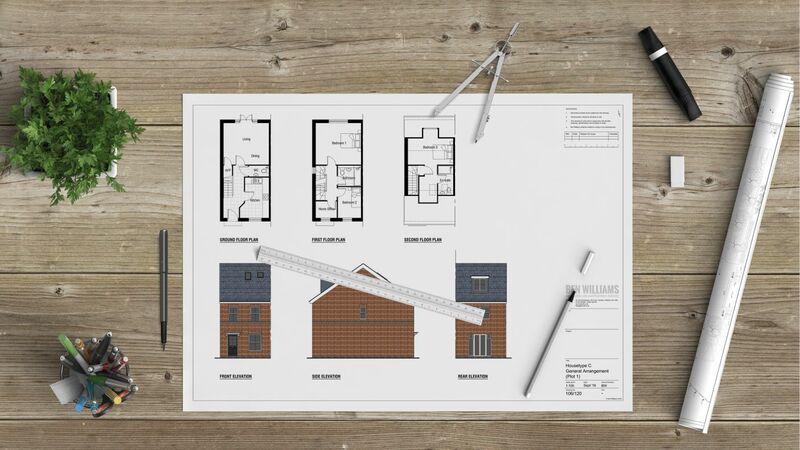 Each planning application must be accompanied with an Ordnance Survey Map, completed forms and documentation and the approriate fee for processing the application. 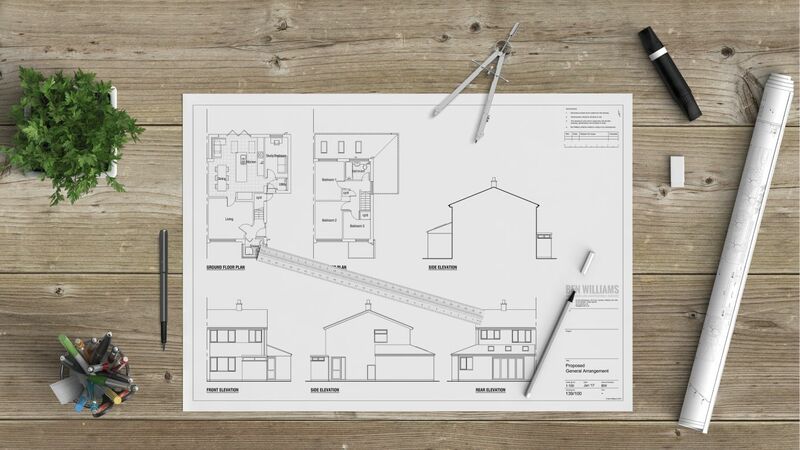 Does your home extension fall under permitted development? How long does a planning application take? Once submitted, the application will proceed through an eight week statutory period of consideration. During the first two weeks of this period, the application will be registered and your neighbours and other interested parties will be notified of the application submitted and your intention for applying a detailed planning permission. Should I inform the neighbours? We would always indicate that prior to submitting a detailed planing applicaiton; that your neighbours are consulted informally to ensure that there are no issues of contention which may delay the application once lodged. Planning application drawing submitted to Wiltshire Council to illustrate the proposed single storey front extension and garage conversion to accommodate an open plan kitchen and dining areas. Planning application drawing submitted to Swindon Borough Council to illustrate the proposed single storey wrap around extension to accommodate an open plan kitchen and dining areas along with a combined study and guest bedroom. Planning application drawing submitted to Swindon Borough Council to illustrate the proposed floor plans of a single storey rear extension to accommodate an open plan kitchen and dining areas. Planning application drawing submitted to Swindon Borough Council to illustrate the proposed two storey side extension to accommodate an open plan kitchen and dining areas, a new family room whilst a first floor a new master bedroom with ensuite bathroom and dressing area. Planning application drawing submitted to Cotswolds Council to illustrate the proposed single storey oak frame extension to accommodate an open plan kitchen and dining areas. What happens if the neighbours object to the planning application? The application will be open to public consultation for a period of 21 days during which time, formal objection or comment can be placed on the proposed application by any party. It must be accepted that your neighbours may object to the application and will be considered by the Planning Officer of the council and a view taken. What happens when a decision is reached for the planning Application? On completion of the consultation period the planning officer dealing with the scheme will assess the application and potential comments made by interested parties and reach a decision. On the assumption that the proposals are not contentious, it is likely that the application will be considered under Officer’s Delegated Power of Authority rather than taking the application to a full Planning Committee. What councils or local planning authorities do you deal with? We have a good working relationship with Swindon Borough Council, Wiltshire Council, Vale of White Horse, Cotswolds District Council, Cheltenham Borough Council and Stroud District Council. We welcome all other councils however a majority of our works are within these regions. It is not uncommon for the Planning Officer to give an early indication of their decision before the eight week consultation period ends. They may also request a few minor changes to the proposed scheme to give it the best opportunity of gaining planning consent. If so, we will liaise with you before any changes are made to the drawings. For many large and complex schemes such as a housing development or a listed barn, there may be a requirement for colour elevations to visualise the materials proposed in relation to the street scene. Assuming the application is approved, it is likely that there will be conditions attached to the planning permission. These usually consist of a requirement to obtain local authority approval such as materials, drainage, vehicle manoeuvring, working hours, which then need to be further approved by the council. Some planning conditions require no further action while others require discharging prior to commencing works on site. Each application to discharge of a condition will attract a fee payable to the Council. It is our recommendation to seek only one application to discharge planning conditions attracting a single fee rather than making several applications over a period of time attracting multiple fees.